Bringing JOY to the child within us all! Denmark Thrills Adventure Park is a beautiful setting in nature, where people of ALL ages, can have a play and move through your comfort zone!! We are home to the Worlds Longest Hydro-orbing track, the only facility of this kind in Australia! Also known as Globe-riding this is a laugh-a-minute get-wet experience popular around the world! Thrills offers a wide variety of activities from Bocce, to Ziplining, to climbing and abseiling, off-road adventure tours, and so much more. There are options to suit all budgets, You can simply pay park entry for only $10 per person and purchase a rides card to pay for the $1 and $2 rides, or pay for Hydro-orbing or 4x4 Tours separately or in one of our great value package deals for a discounted rate. Maintaining a high levels of safety and service are important to us, So bookings are essential at any time! Rides Cards are for the pay-as-you-go activities, which require a staff members supervision. 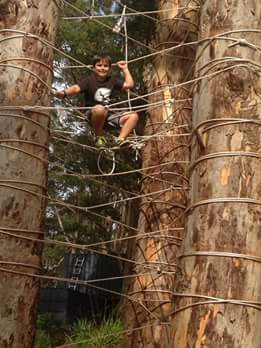 Including: Bubble Soccer – $2 per person for 5 minutes, Tree climbing and abseiling $2 per Climb, 60m Flying fox $1 per fly, Giant Tree Swing $1 per swing, Rock wall climbing and abseiling, $2 per climb, 95m Flying fox $2 per turn. You are welcome to bring your own food and drink and use the fridge/freezer, BBQ facilities and Picnic tables provided. Most people who bring food with them, spend many hours enjoying the fun. We don’t sell food or drink on site. We do provide drinking water and basic tea and coffee making facilities free of charge. Denmark Thrills only accepts payments through our online booking system, or with credit or debit card on site when you arrive, we are a cashless facility. Denmark Thrills aims to provide a profitable, fun, safe, healthy attraction that supports the positive growth of our community, by highlighting the unique environment that Denmark has to offer. This park has been developed with the love of many families in the Denmark Community. Who have brought what they have to give with the intention to create somewhere joyful, for the good of our town and regions development as a whole. I give thanks for The Castelli Group and all of our other local people and businesses who have contributed their time, energy and resources to see this park come to life. BOOK NOW on 0434 070 434, to enjoy your fun day amongst nature!